Compared to the other options out there, only DISH provides high-definition programming on all mobile antennas. You can take your home-viewing experience with you and experience the same picture quality in the outdoors as you do at home. In addition to high-definition TV, you only have to pay for the months you use with Pay As You Go outdoor packages from DISH. Start out with over 50 channels for as low as $34.99 per month in what's known as the Flex Pack. You can also increase your channels with other packages, depending on what shows you want to watch. If you're already a DISH customer, it's as simple as adding $7 per month to your home account to get set up with HD TV for your on-the-go vehicle. It also puts everything into one easy-to-pay bill. It's a customer-friendly solution that takes the hassle out of paying for outdoor TV. VARIETY OF USES. SAME SOLUTION. Taking TV to the outdoors can be applied to several different applications or scenarios, but it all comes down to the same solution. 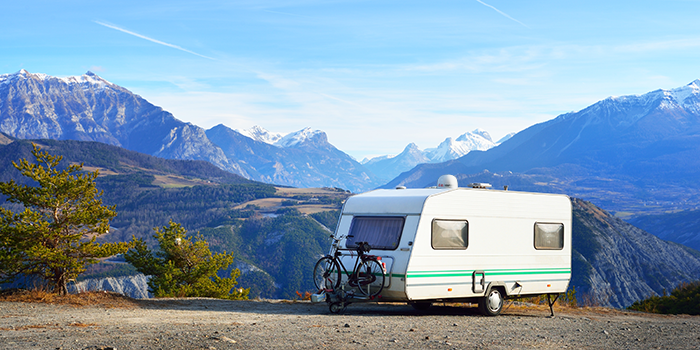 U.S. ownership of RVs is reaching record levels with an estimated 10 million households now owning an RV. * More and more people are getting into the backcountry, mountains or sightseeing. Why not take your TV service with you to watch in your downtime? Millions of campers pitch their tents in campgrounds all over the U.S. and can benefit from watching a movie or show while sitting near the campfire. As long as you have a power supply, all it takes is a TV screen, a mobile antenna, a DISH receiver and some s'mores to enjoy your favorite programming under the stars. With the ability to go mobile, tailgating parties continue to expand at stadiums across the country. Millions of fans arrive 3-4 hours before kickoff to start the party, which gives plenty of time to enjoy some TV with your hot dogs, burgers, and brats. 3.5 million truck drivers span out across America to keep our businesses and economy rolling along at a fast pace. ** Imagine how many of those truck drivers would love to have a mobile DISH antenna handy to keep them entertained while settling down at a rest stop. Nearly every outdoor activity—including hunting, fishing and hiking—can be improved by setting up a TV watching area back at base camp. Satellite TV can be set up just about anywhere. As you can see, no matter how you want to use DISH outside the home, you can make it happen! After you see how easy it is to get set up with one of DISH's outdoor packages, you should consider it as a business opportunity too. 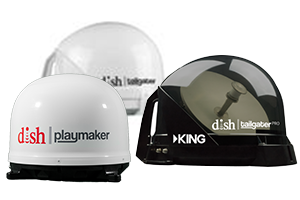 Becoming a DISH Authorized Retailer can be a profitable venture, especially being able to provide millions of potential customers with the best outdoor TV solution available in the U.S.
RS&I teamed up with DISH a long time ago as a master sales agent and distributor to help small businesses succeed in the satellite TV arena. Reach out to us and we'll help you find out how to get started.